Though Microsoft has touted its forthcoming update to Windows Phone 7, codenamed "Mango," as having better HTML5 performance than Apple's iPhone, new tests run using an iPhone 4 with the iOS 5 beta outpace the Windows Phone results. Microsoft demoed the Mango update last month boasting 500 new features, including a mobile version of Internet Explorer 9. In a preview video, Microsoft vice president Joe Belfiore ran a test between phones running Windows Phone 7, Android, BlackBerry OS and iOS and declared Windows Phone the winner. 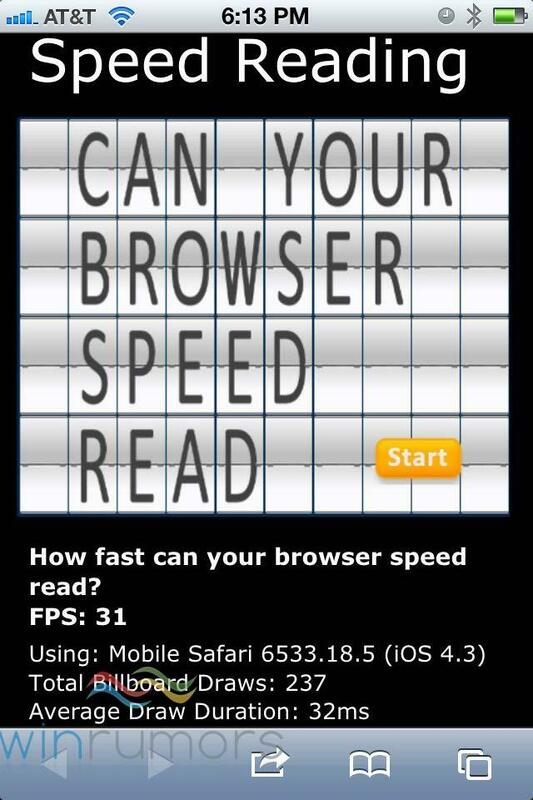 According to the test, Microsoft's device rendered HTML5 content at 24 frames per second, compared to 2 frames per second on the iPhone 4. It should be noted, however that the test was developed by Microsoft specifically for mobile IE9 and the tested iPhone 4 was using Wi-Fi only, while other devices appeared to be using a 3G connection. Apple may have beat Microsoft at its own test, though, as an iPhone 4 running the beta release of iOS 5 has reached 31 frames per second on the test, as noted by WinRumors. However, a screenshot demonstrating the test results still lists the iOS 4.3 version of Mobile Safari. Windows Phone 7 and iOS 5 are both scheduled for a fall release, though Microsoft and Apple have yet to set specific release dates. Apple unveiled iOS 5 earlier this month at the Worldwide Developers Conference. The free update is billed as having a PC-free design with wireless syncing and updates. Apple boasts 200 new user features and 1500 APIs in iOS 5. Meanwhile, Microsoft has teamed up with Nokia, reportedly paying billions to Nokia in exchange for the company's commitment to Windows Phone 7. In February, Nokia announced plans to ditch its Symbian mobile operating system and begin making smartphones running Windows Phone. Nokia confirmed last month that the first of its devices to run Windows Phone 7 will feature the Mango update. Research group IDC predicts the Microsoft and Nokia partnership will help boost Windows Phone market share from 3.8 percent in 2011 to 20.3 percent in 2015, while Apple's share of the worldwide smartphone market is expected to dip from 18.2 percent to 16.9 percent during the same period.